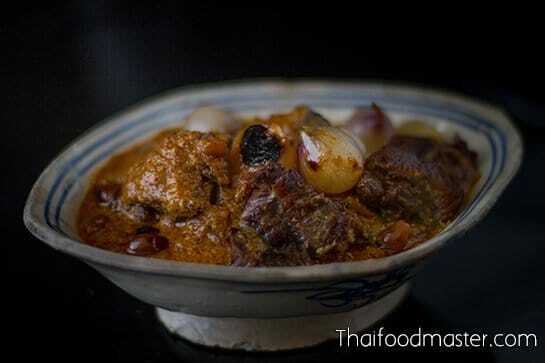 Massaman is usually made with chicken, beef, lamb, mutton or goat. 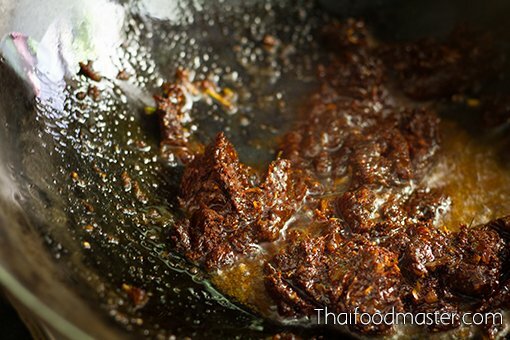 Sometimes the meat is fried in butter or fat, prior to simmering it in sweet spices and coconut milk until the meat softens and the curry thickens, a process called khao gathi (เข้ากะทิ). In the Arabian culinary tradition, almonds (ลูกมะด่ำ, อัลมอนด์), peanuts or sultana raisins (ลูกกิจเสม็ด) are included to add joy and richness; and the dish is seasoned to a sour-leading sweet, to follow the taste with a pleasant, throat-cooling sensation. 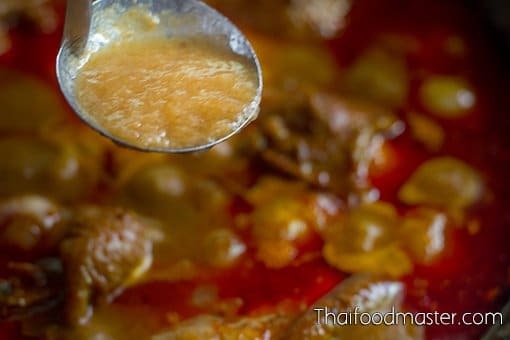 The Thais adapted this curry using Thai ingredients such as fermented shrimp paste (kapi), lemongrass, tamarind and bitter orange juice, and making it spicier. Sometimes potatoes were added, and even pineapple – Massaman curry was considered a dish reserved for special occasions and religious ceremonies. 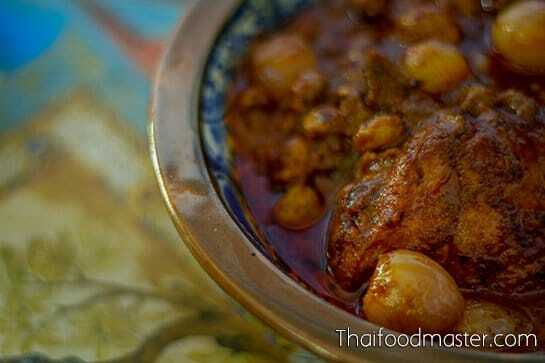 Massaman curry, or ‘the curry of the Muslim’, was popular among Siam’s residents of Muslim descent for many centuries. The Thai word moot salim, or ‘Muslim’ (มุสลิม), is derived from the Persian/ Arabic word moot limaan (มุสลิมาน). Massaman was introduced to Siam directly via Muslim Persian traders in the 17th century. 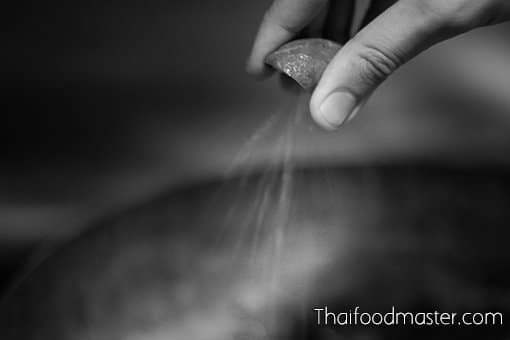 Massaman was created in Siam’s Muslim communities, using Muslim culinary codes and Siamese ingredients, during the Ayutthaya period or as late as the Thonburi era (18th century). 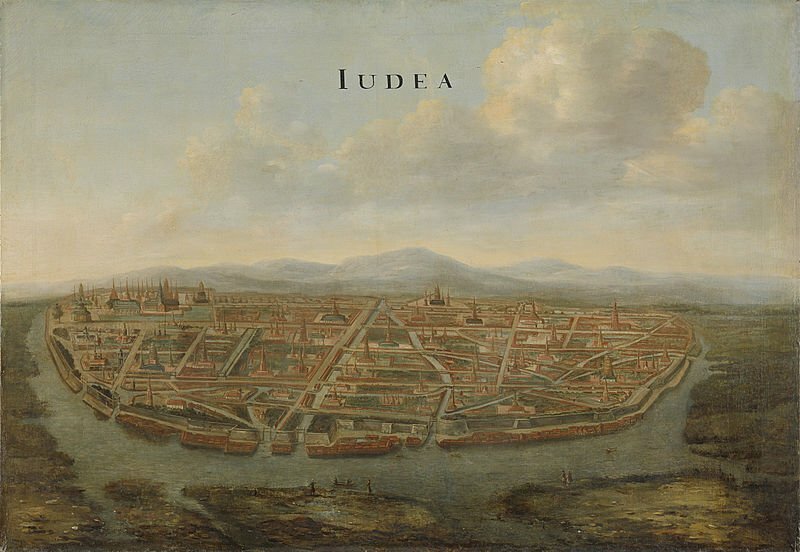 The period of Persian influence appears to have begun in early 17th-century Ayutthaya, reaching a peak during the reign of King Phra Narai (1656-1688). After a series of coups, rebellions and power struggles provoked by ambitious princes, King Phra Narai came to power with the active assistance of the Iranians and the Japanese, who stormed the royal palace, allowing Prince Narai to usurp the throne from his uncle, Somdet Chaofa Chai. During King Phra Narai’s reign, foreign communities in Siam flourished due to religious and political factors. As well, the Siamese court actively encouraged increased foreign trade and settlement in Siam in an effort to expand trade and generate more revenue for the Royal Treasury. Most of the Thai written records from that period were burned in the flames that swept and consumed the capital during its 1767 fall to the Burmese. Thus foreign records of the time – as biased as they may be – are of great value in the reconstruction of Thai history. Sunni Muslims, from countries west of Siam or of Indo-Malay origin. settled outside the city walls near the river where the merchant ships were moored, practicing the import and export of goods from Siam. Shiite Persian Muslims were granted residence within the city walls side-by-side with the Chinese and the Siamese elite. They were mainly merchants who bought and sold luxury goods such as Persian carpets, rose water, opulent fabrics, jewelry and gold ornaments; their clientele were, naturally, members of the aristocracy of that era. These connections, and subsequent interaction between the Persian Muslims and the Siamese, also most likely facilitated culinary exchange. Some descendants of Persians from the Ayutthaya period eventually converted to Buddhism, and continue to maintain a presence in Thai public life to the present day; a prominent example is the Bunnag family, whose ancestor, Sheikh Ahmad Qomi, is said to have come from the Safavid dynasty, and who arrived in Ayutthaya from Persia in 1602. He had risen to the position of Jao Krom Ta Kwa (เจ้ากรมท่าขวา), literally ‘Lord of the Right Pier’, in charge of all seaborn trade traffic coming from the West to Ayutthaya. He also rose to the rank of Chularachamontri, the royal overseer of Muslims in Siam. After the fall of Ayutthaya in 1767, the Muslim communities fled to Bangkok. Led by Sheikh Ahmad Qomi, they settled in communities around the Klong Bang Luang canal (also known as Bangkok Yai Canal) (คลองบางหลวง). Many were rafters, selling various goods; they were described as Khaaek Phae, or Thai Muslims who lived on rafts along the canal. 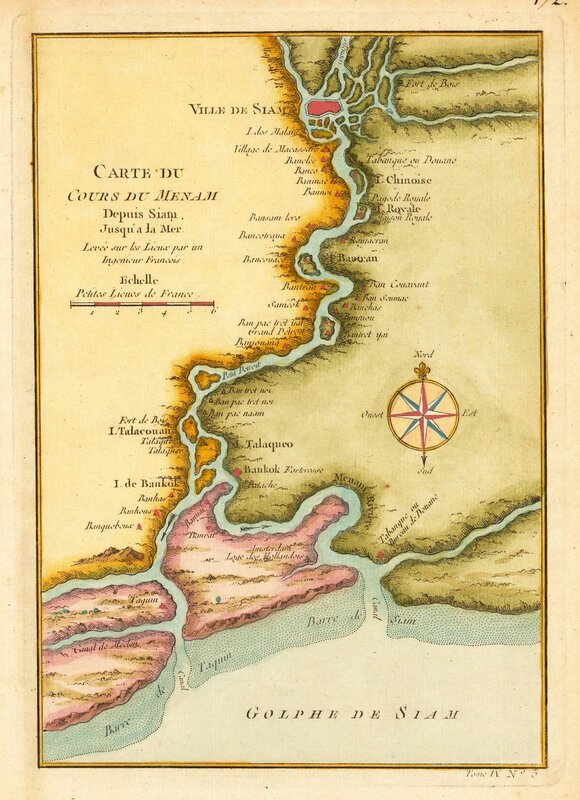 Carte du Cours du Menam Depuis Siam, Jusqu´a la Mer. The Kudi Khao, or Bang Luang, community is one of the oldest Thai-Muslim communities in Bangkok. This Islamic influence is reflected in the mosques (Kud กุฎี) in the area – Kudi Khao Mosque (กุฎีขาว), built in the 18th century, and Ton Son Mosque – and through delicacies that permeate the air with tempting aromas, including Massaman curry (แกงมัสมั่น), guruma curry (แกงกูรุม่า), roti (ลุดตี่ โรตี), room (หรุ่ม) and khanom muscat (มัสกอด). These dishes made their way into the royal Thai cuisine as early as the beginning of the Ratanakosin era; King Phra Phutthayotfa Chulalok (Rama I) was from the vicinity of Klong Luang canal, and it is likely that he was on good terms with the Muslim community and thus familiar with its cooking. It was in his reign that Kudi Khao Mosque (กุฎีขาว) was built; the structure is similar to that of a Buddhist temple, with green terracotta roof tiles – green being a symbolic color in Islam. Moreover, one of the King’s consorts was a member of the Muslim community: Jao Jom hohng was the daughter of a Thai Muslim community leader, Chularachamontree (Gorn Keaw) (เจ้าจอมหงส์ ธิดาพระยาจุฬาราชมนตรี, ก้อนแก้ว). The leaders of these Thai Muslim communities had court responsibilities, such as looking after the food offered to monks and visitors during the 1809 celebration of the Temple of the Emerald Buddha (Wat Phra Kaew). Muslim cuisine, therefore, was quite familiar to the Siamese court, and we can find mention of Muslim dishes in the era’s literature and poetry, the records and chronicles, and even in the writings of King Rama II. 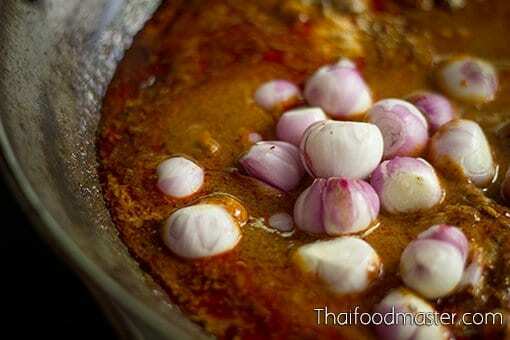 “Matsaman curry is like a lover, as peppery and fragrant as the cumin seed. Its exciting allure would arouse any man. I am urged to seek its source” (translation: Phanu 2010). The dishes referenced in King Rama II’s poetry were attributed to Queen Sri Suriyendra (Princess Bunrod), whose family came to settle in the waterways of Klong Bang Luang after they fled Ayutthaya. 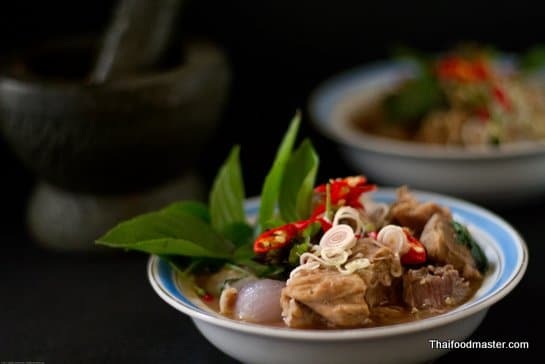 It was during her childhood in Klong Bang Luang that she developed her cooking skills, adopting foreign-influenced dishes from the area’s ethnically diverse settlers. We have examined the relationship that developed over two centuries between the Siamese and Persian-Arab communities prior to the first mention of Massaman curry in the poetry written by King Rama II; we have also revealed the impact of the influential Muslim communities of Bang Luang during the Thonburi and early Ratanakosin periods; and the position that enabled the sharing of their culinary codes with the aristocratic food culture. 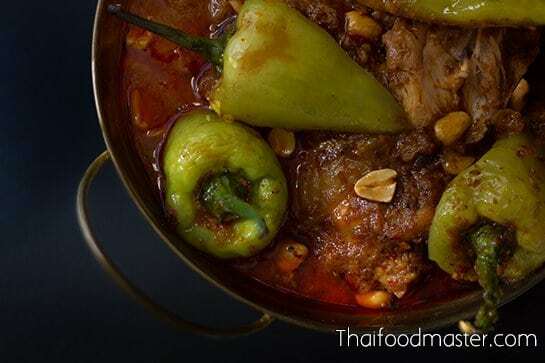 These are all factors that contributed to the culinary exchange between the Siamese and the Muslims, a fertile ground from which Massaman was born – a Muslim curry that incorporates Thai ingredients and has become a truly Thai dish. 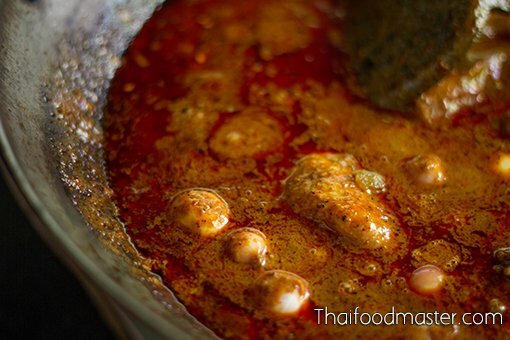 What follows is a detailed examination of the two first-known recipes for Massaman curry ever written in Thai. Beef Massaman, by Maawm Sohm Jeen (1890), and chicken Massaman by Lady Plean Passakornrawong (1889). It is important to mention that both ladies were married to descendants of the aforementioned Sheikh Ahmad Qomi of Bunnag lineage. 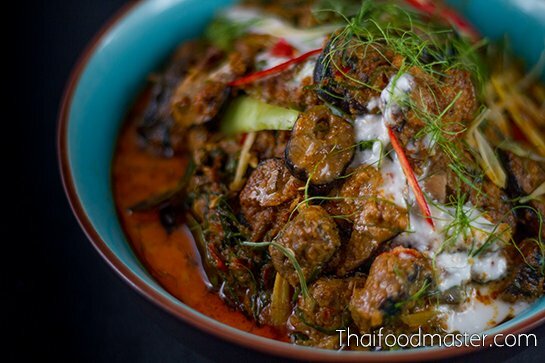 This is the recipe for beef Massaman that appeared in the 1890 (2433 BE, 109RE) book “Tam Raa Gap Khao (ตำรากับเข้า)”. 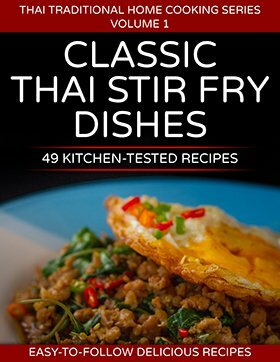 Published by the Wacharin printing company (โรงพิมพ์วัชรินทร์) and written by Maawm Sohm Jeen, this is considered to be the first complete cookbook ever published in the Thai language. 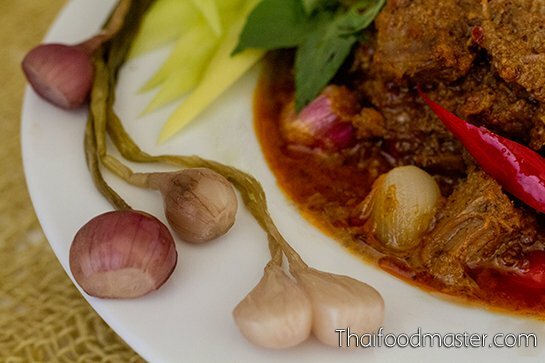 Maawm Sohm Jeen provide two recipes for Massaman, which she spells maa cha maaen (มาชะแมน): the recipes are the same, differing only in the meat used. The first is made of beef, lamb, domestic (imported) or wild rabbit, or fish (perch, ปลาหมอ). In the second recipe, she uses goat for the Massaman. Maawm Sohm Jeen begins by cutting the meat (600 gr) into large pieces and frying it either in ghee or pork fat. 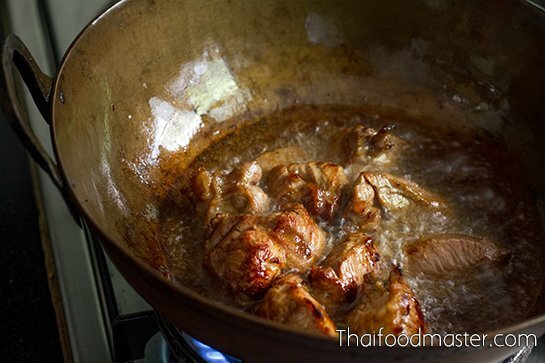 For goat meat, she specifically directs the reader to use ghee for the frying process, as pork fat will spoil the goat Massaman curry taste. Once the meat is cooked and has a golden color, it is set aside. 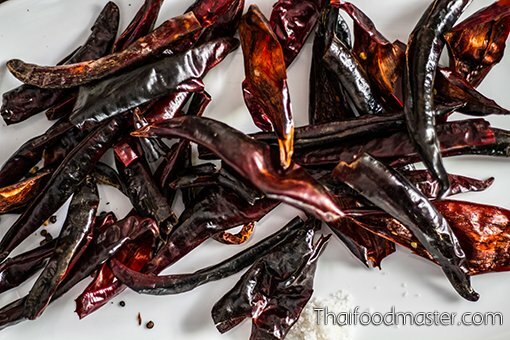 A curry paste is then made from equal quantities (3.75 gr each) of charred dry long chilies, roasted cumin seeds, roasted coriander seeds, roasted lemongrass and roasted white peppercorns, to which 15 small charred shallots and the entire amount of salt needed for the dish are added. 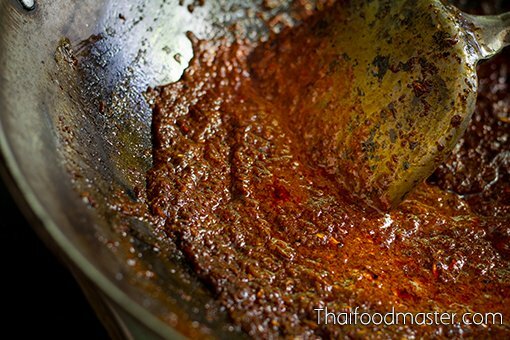 Each curry ingredient is roasted before it is pounded smooth. 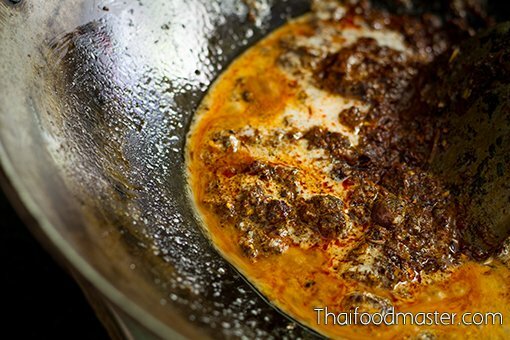 The curry paste is dissolved in coconut cream, and allowed to come to a boil until the oil has separated and is floating on the top; then the pre-fried meat is added back into the curry, and immersed until covered with coconut milk. Maawm Sohm Jeen then adds sliced ginger (15 gr), 15 pcs of cloves, and cinnamon (3.75 gr), letting all come to a boil again before she adds bitter orange juice, which Maawm Sohm Jeen says is preferable to tamarind. The lid is closed, and the meat is simmered until tender. Finally, she adds 5-6 bay leaves and 20 small charred roasted shallots, and seasons the curry with 15 gr palm sugar. Maawm Sohm Jeen explains that, according to the Khaaek tradition, a good Massaman should have a sour-leading sweet to follow taste with a pleasant cooling throat sensation. 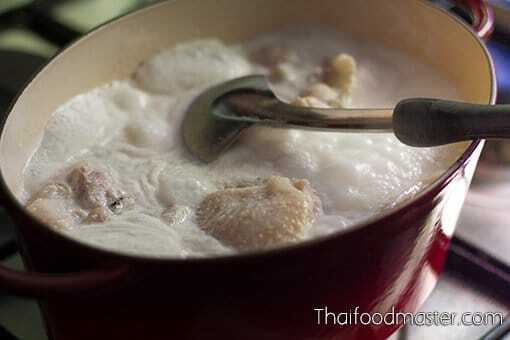 She also mentions that one can add almonds (อามันด้ม) or roasted peanuts if desired. 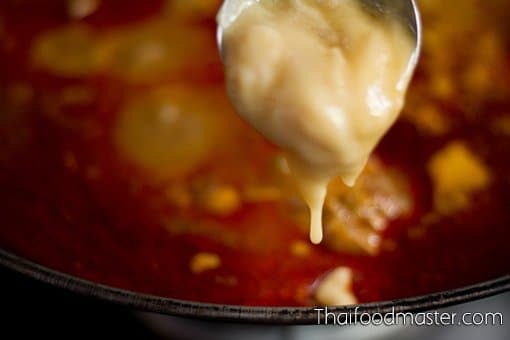 This version of Massaman curry does not uses potatoes or onions, and the flavor it presents is not as sweet or as complex as modern day Massaman. Bpradtithin Bat Laae Joht Maai Haeht (ประติทินบัตร แล จดหมายเหตุ) was a monthly journal published just five times between 1889 and 1890. In this publication, Lady Plean Passakornrawong, who in 1908 will write the epic cookbook “Maae Khruaa Huaa Bpaa” (แม่ครัวหัวป่าก์), published a food column in which she shared recipes. 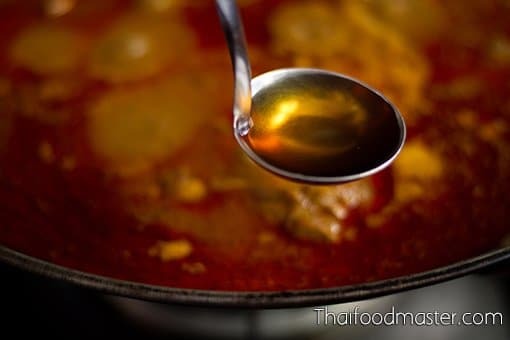 Massaman is the first recipe that Lady Plean (gaaeng matsaman sai naam sohm saa, แกงหมัดสมั่นกับน้ำซ่มซ่า) published: it is thus the earliest known recipe for Massaman curry written in the Thai language. 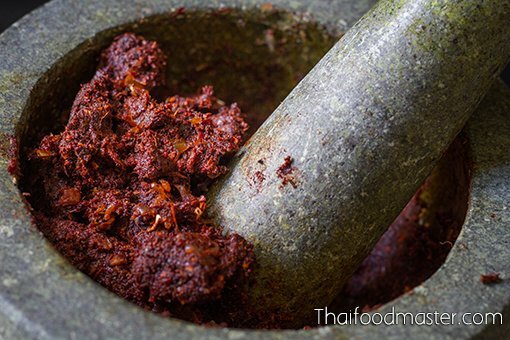 The curry paste in Lady Plean’s version is more complex than Maawm Sohm Jeen’s, and contains dry chilies, mace, nutmeg, Thai cardamom, coriander seeds, cumin seeds, white peppercorns, lemongrass, coriander root, shallots, garlic, salt, and fermented shrimp paste (kapi) – each one of the ingredients is roasted, and then pounded into a fine paste. 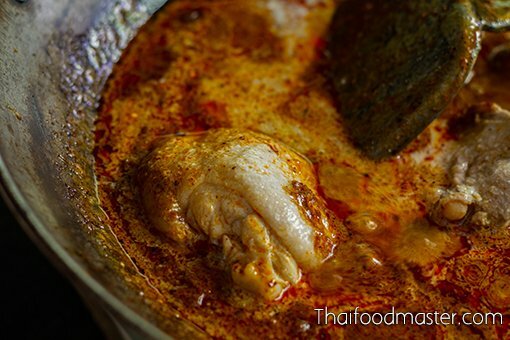 The chicken is simmered in coconut milk; the curry paste, separately, is fried until fragrant in generous amounts of pork fat, and then mixed into the simmering chicken. Shallots and sultana raisins (called gitsamet, กิจเสม็ด) are added, and the curry is seasoned with palm sugar, fish sauce and tamarind paste; just before serving, a generous amount of bitter orange juice is added. Here we would like to thank Dr Kusuma Raksamanee from P.E.N. International Thailand-Centre, who kindly explained to us that the word “gitsamet (กิจเสม็ด)”, as it appears in the recipe, is derived from the Hindi word “kishmish (किशमिश)”, meaning “raisins”. Again, the curry should be thick and gravy-like, with a leading sour taste that leaves as a distant echo both the sweetness and saltiness. 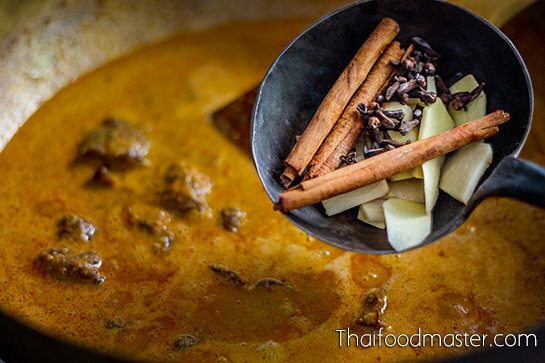 You could see by now that old-style Massaman curry has a sour-sweet-cold flavor, and is cooked traditionally without potatoes or yams. 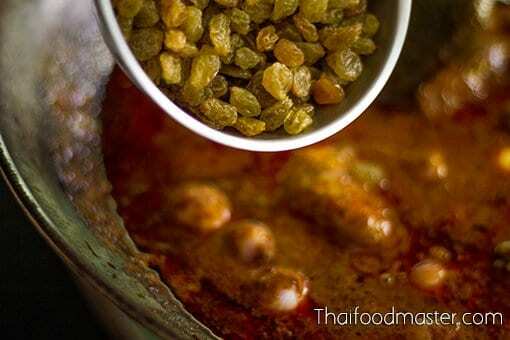 In the early days, it would be served with a spice-infused rice dish, khaao boo ree (ข้าวบุหรี่), that is the Thai version of yet another Persian dish – Biryani rice (ข้าวบริญานี) – or the curry would be served together with roti (โรตี หรือลุดตี่ แป้งกลอก), the Thai version of Indian bread. Please resist the urge to add herbs; this is Massaman curry, and your herbs should remain in the herb planter box. If you choose to follow the recipe described below, in which we closely followed the original, you can deep fry the chicken first, and also deep fry the onions and potatoes if you choose to use them in the curry. While Lady Plean uses only raisins, we highly recommend the addition of peanuts as well, for an extra earthy-nutty flavor. 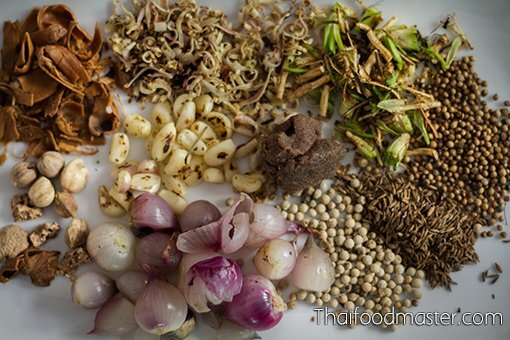 This is the first-ever recorded recipe for Massaman curry - published in 1889 in Bpradtithin Bat Laae Joht Maai Haeht (ประติทินบัตร แล จดหมายเหตุ) by Lady Plean Passakornrawong. I just made curry from an American Recipe. It was not near the curry we eat from Thai Terra. I am excited to see the authentic recipe with fresh ingredients. I am going to try these soon!